Thanks to The New York Times food section for a terrific tip on having great bread on hand whenever you want it. Slice and freeze it. Don’t freeze a whole or half loaf; it’s not very good. The trick, says the Times, whether you make your own bread or buy a high quality loaf, is to cut it into individual slices. Put the slices in a plastic zipper bag and freeze them. When you’re hungry for a piece of toast or a sandwich with good bread, just pop the frozen slices in the toaster. The fresher the bread when you freeze it, the better toast you’re going to have. I’d say it’s both. Sure, it’s convenient to grab only the number of slices you need, but food science has also proven that the best way to halt the staling process is by wrapping the bread well and keeping it in the freezer. Serious Eats did an interesting experiment on this. 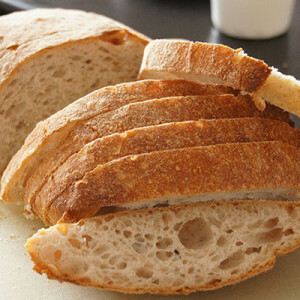 You can find it here: http://www.seriouseats.com/2014/06/does-refrigeration-really-ruin-bread.html. It’s more about how NOT to store bread, but the author’s ultimate conclusion is that when it comes to storing really good bread, the freezer is your friend, especially if you visit the bakery infrequently and want to stock up.